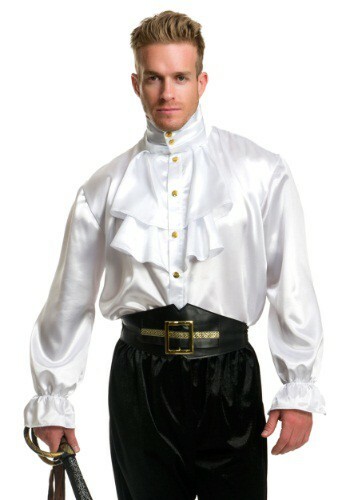 The white ruffle shirt, or sometimes better known as the "poet shirt," is probably most famous as being worn by outlandish rockers on stage and romantic pirates in the movies, even though historically it is very different. The modern day take on this shirt was formed by combining the fanciness of a rich man's blouse with the common everyday boys shirt. The actual shirt was a popular style in the 19th century, but was used for much more common purposes that the portrayals in movies that we see today. This shirt is 100% polyester satin with functional gold buttons. The ruffles in front are two-tiered and attached to the collar. There are elastic bands on the cuffs to make sure they fit around your wrists. We have tons of different accessories that would be great to add to this shirt, such as pirate swords and hats, as well as other costume pieces sure to make those around you swoon.